There are so many players at Hockey Canada's world junior championship selection camp that the ice was completely torn up after just one practice, with pucks bouncing over sticks and snow piling up against the goals. Head coach Dominique Ducharme put 32 of his charges through two practices on Tuesday, rotating through four goalies and trying to give the 18 forwards and 10 defencemen a good look as he, team lead Joel Bouchard and head scout Brad McEwen have to narrow their roster down to 22 by Friday. Only defenceman Dante Fabbro sat out as he nursed an undisclosed injury. 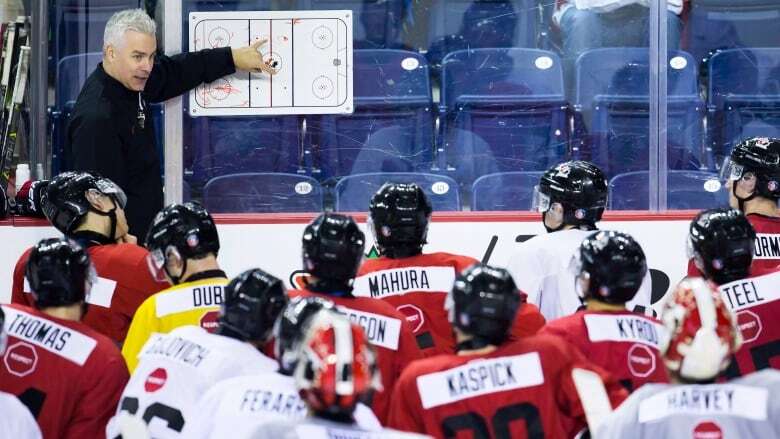 "It's going to be interesting to see the battles, because we strongly believe that the 33 guys here have the chance to make this team," said Ducharme outside Canada's locker room at the Meridian Centre. "It's their job to make us make difficult decisions. "That's what we want, for them to force us to make difficult decisions and find the best 22 guys." Some of Ducharme's decisions will be easier than others. Seven players are returning from last year's silver-medal roster. Goaltender Carter Hart (Everett), defencemen Jake Bean (Calgary), Kale Clague (Brandon) and Fabbro (Boston University) and forwards Dillon Dube (Kelowna), Michael McLeod (Mississauga) and Taylor Raddysh (Erie) are all back. Defenceman Victor Mete, who was loaned to Team Canada by the Montreal Canadiens on Monday, is also a safe bet to make the final cut. The 19-year-old Woodbridge, Ont., native has four assists and a plus-5 rating in 27 games with the Canadiens this season, averaging 14:52 of ice time per game. That leaves 14 spots to be filled, even though Ducharme insists that everyone will have to earn their way on to the roster. McLeod, who had two goals and an assist for Canada at last year's world juniors, has given advice to some of his teammates trying to make this year's roster. "Don't look too much into what the lines are going to be at practice," said McLeod, who has eight goals and five assists in 11 games for the OHL's Steelheads this season. "Just play your game, don't try to do too much, just play your game." Hart is Canada's presumptive starting goaltender after earning a 2.38 goals-against average with a .906 save percentage in last year's tournament. He's been event better for the WHL's Silvertips this season with a 1.32 GAA and a .961 save percentage. Hart believes that the way to impress Canada's decision makers is to have the right attitude. "Hockey Canada's evaluating your every move, so just being a pro on and off the ice and treating people with respect will go a long way," said Hart. He also added that he's pleased to be competing with Michael DiPietro (Windsor), Samuel Harvey (Rouyn-Noranda) and Colton Point (Colgate University) for a spot in net because it forces him to elevate his game. Ducharme himself wants to remind all 33 players to be confident in their abilities and to remember what kind of play earned them the invitation to selection camp in the first place. "There's a reason why they're here. They have strengths. We want to see those strengths on the ice," said Ducharme, who wants to put an emphasis on speed this year. "Obviously, we have expectations for them, the way we want to see them conduct themselves on the ice. To see how they work within the philosophy of the team." Canada plays an all-star team from universities across the country on Wednesday and Thursday before facing Denmark in an exhibition game on Friday. All three games will be at the Meridian Centre before Hockey Canada makes its final cuts.